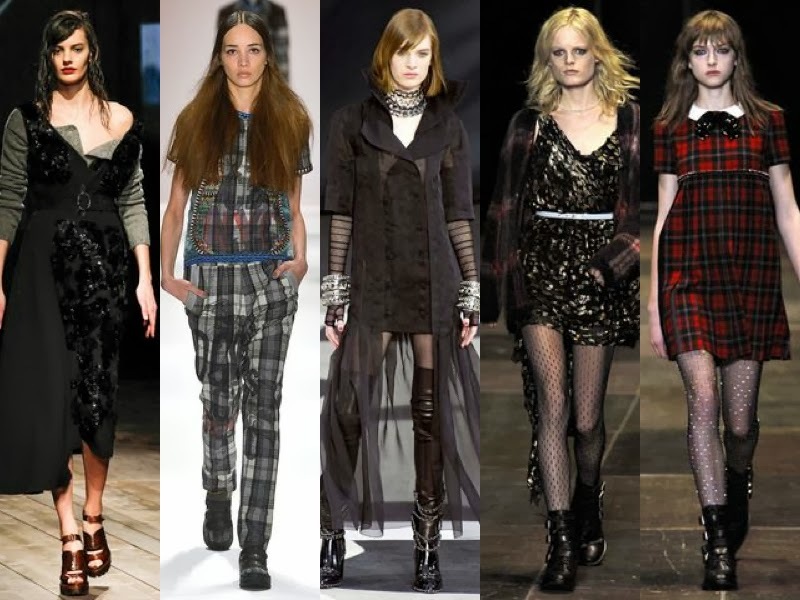 The Fashion Guide Blog : Rule # 28: How to wear the grunge trend. It has been a while since my last post but I've been really busy with the new blog that soon will be available, work and a bit of holidays, but I am back! I said it before and I’ll say it again, every fashion and trend fades away and then comes around again. I grew up in the 90s listening to Madonna, Michael Jackson, Queen, Björk, Tracy Chapman, The Cardigans, Ace of Base, Duran Duran and Nirvana. That was my 90s playlist on my Walkman and then Discman, because there were no iPods back then! Well, I'm not here today to talk about music but to talk about that new trend that is already on the streets all over the world, thanks to one of the greatest bands of the 90s, Nirvana. I'm talking about grunge. Checks, black & red shirts, leather, denim, clean faces, messy hair. Grunge makeup doesn’t require eyeshadow mixtures or sparkles, play natural, preferably with darker tones. For example, a good idea is to create bushy eyebrows and add a bold touch to your lips by wearing some deep color, creating wine-stained lips. Give preference to darker colours, since the colour of grunge is black. The modern grunge also allows wearing gray, neutral tones and other colours than black, however, essential grunge loves darkness. Update your wardrobe with denim. This can be a denim jacket or vest, denim shorts or jeans, preferably ripped, worn-out, stone-washed or dark. Leggings and lace, ripped or patterned tights in darker hues have become essential elements in a grunge-style wardrobe, replacing denim. If you don’t love baggy jeans, you might like to embrace this tendency. Flannel shirts are a must for a chic grungy look. If you want to look more feminine, you may opt for not too loose flannel shirts. You can wear your flannel shirt as a tunic over a pair of leggings or tight jeans, or with denim shorts, matching it also with a tight tank top underneath. It’s hard to imagine the grunge style without the signature band t-shirts and crop tops, or ones featuring interesting graphic prints and patterns. You can also pick a t-shirt with flag motifs. Leather in all its forms has become an important detail in the grunge style. This can be a biker leather jacket or leather shorts, a leather skirt or leather boots. A tight black leather dress worn with patterned or ripped tights will instantly make you look grunge. Forget about heels, and go for clunky shoes! The grunge style is all about comfort and insouciance. Chuck Taylors, Doc Martens or combat boots are a must for a totally chic grunge look. Details matter in the grunge style! Don’t forget to finish off with edgy accessories, such as ones featuring chains, spikes, studs, zippers and metallic details. Round sunglasses and a headscarf can also be a good addition. 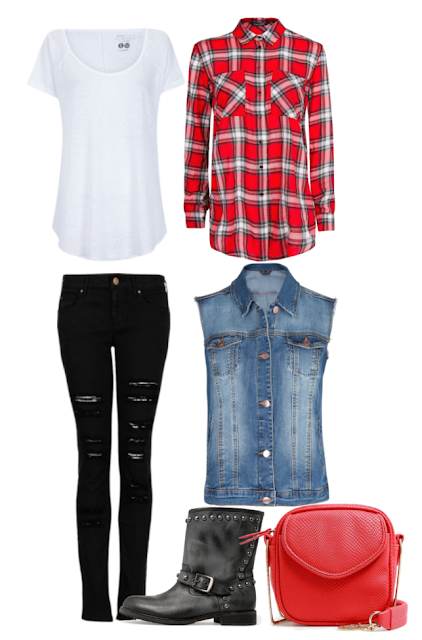 When picking grunge accessories, try to be minimal, going for this or that item and not everything altogether. When it comes to the handbags, you can either go for oversized bags or cross or tiny cross body bags. Layering is grunge! Don’t be afraid to experiment! Layer, mix and match, play with contrasting prints and patterns confidently, making new stunning grunge looks. Have a look at the following looks I created for you and have a great week! Dress, Boohoo.com. Blazer, Mango. Ankle boots & bag, Zara. Leather trousers, Mango. Stitch jumper & bag, Topshop. Shoes, Aldo. Muchas gracias Montse. Me alegro que te gusten. Un estupendo artículo como siempre. Me gusta la tendencia pero sin llegar al extremo. Ya he creado algún estilismo y seguro que haré alguno más durante la temporada. De tus propuestas me encanta la del vestido de tartan. Besitos y que tengas un estupendo fin de semana! !